The New York State Department of Environmental Conservation (DEC) today released its Draft Aquatic Invasive Species (AIS) strategy to prevent the introduction and spread of AIS in New York State for public comment. Comments will be accepted through December 15. Aquatic Invasive Species threaten the ecology of New York’s rich abundance of waters and can harm water-based recreational opportunities and economies. New York is particularly vulnerable to AIS due to its vast marine and fresh water resources, major commercial ports and the easy access that ocean-going vessels have to the Great Lakes via the State’s canal system. Managing an infestation is extremely costly, so prevention is the most cost-effective strategy. Identify and evaluate risks associated with pathways for AIS introduction and movement within New York. Aquatic invasive species arrive by many pathways including direct introduction, live animal trade, the nursery and landscape trade, recreational boating and cargo transportation. Northern Snakehead, Sea Lamprey, Round Goby, Hydrilla and the New Zealand Mudsnail are examples of aquatic invasive species present in some New York waters, which can prey upon or displace native species, alter habitat or otherwise harm native species. The Draft Aquatic Invasive Species Management Plan can be viewed on DEC’s website. Public comments will be accepted from October 30 through December 15. You can send comments to the address below or email them – enter “AIS Management Plan” in the subject line. A new regulation that prohibits hunting or trapping of free-ranging Eurasian boars in New York State was formally adopted state Department of Environmental Conservation (DEC) Commissioner Joe Martens announced today. The regulation is designed to ensure maximum effectiveness of DEC’s statewide eradication efforts. Governor Cuomo signed legislation on October 21, 2013, which immediately prohibited the importation, breeding or introduction to the wild of any Eurasian Boars. Furthermore, the law prohibits possession, sale, transport or marketing of live Eurasian boars as of September 1, 2015. The new law was an essential step in the state’s efforts to prevent Eurasian boars from becoming established in the wild. However, there are already small numbers of Eurasian boars on the landscape in New York. Since 2000, wild boars have been reported in many counties across the state, and breeding in the wild has been confirmed in at least six counties (Tioga, Cortland, Onondaga, Clinton, Sullivan and Delaware) in recent years. DEC is working closely with the U.S. Department of Agriculture’s Wildlife Services program to remove any Eurasian boars that are reported in New York. To date, more than 150 animals have been captured and destroyed. However, eradication is expensive, time consuming and requires a great deal of manpower. Hunters pursuing wild boars in locations where baited traps have been established by DEC or USDA can also undermine these costly and labor-intensive capture efforts. Shooting may remove one or two animals, but the rest of the sounder scatters and rarely comes back together as a group, thereby hampering eradication efforts. In addition to prohibiting take of free-ranging swine by hunters, the new regulation prohibits anyone from disturbing traps set for wild boars or otherwise interfering with Eurasian boar eradication activities. 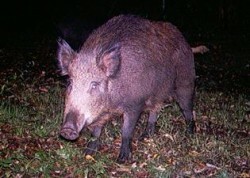 Hunting wild boar is still allowed at enclosed hunting preserves until September 1, 2015. The regulation does provide necessary exceptions for state and federal wildlife agencies, law enforcement agencies, and others who are authorized by DEC to take Eurasian boar to alleviate nuisance, property damage, or threats to public health or welfare. Anyone who observes a Eurasian boar (dead or alive) in the wild in New York should report it as soon as possible to the nearest DEC regional wildlife office or to: fwwildlf@gw.dec.state.ny.us and include “Eurasian boar” in the subject line. Because it is sometimes difficult to distinguish a domestic pig, pot belly pig or Eurasian boar based solely on a description, reporting of all free-roaming swine is encouraged. Please report the number of animals seen, whether any of them were piglets, the date, and the exact location (county, town, distance and direction from an intersection, nearest landmark, etc.). Photographs of the animals are especially helpful, so please try to get a picture and include it with your report. Full text of the regulation can be viewed on DEC’s website.